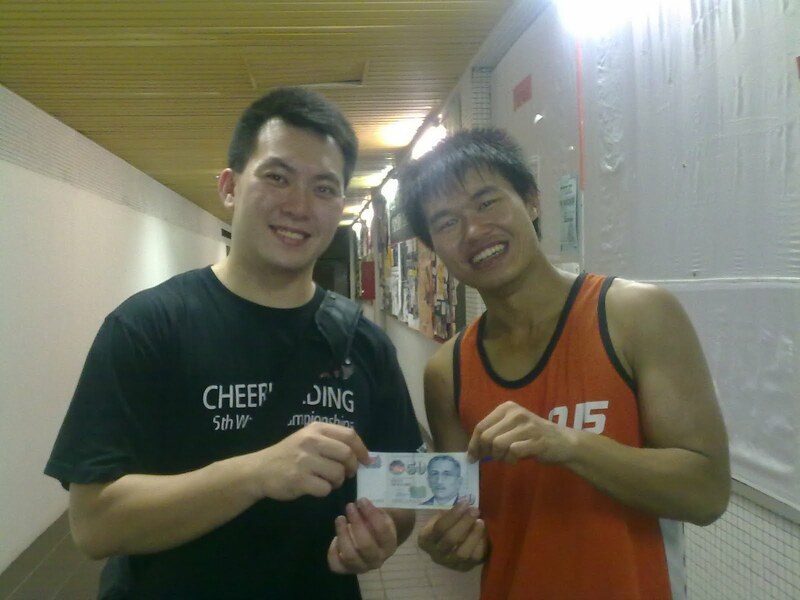 2nd Blog Post of the Month is a post by Tze Swen from Vikings, NTU Hall 5 Cheerleading. "One year ago, I put my name on the sign-up sheet for Cheer Clinic because the other guys in my OG also did the same. We did it so that the cheerleaders will stop pestering us. Of course I didnt have the intention to turn up at the clinic at all. And I really didnt go." How many of you cheerleaders had this exact same experience as Tze Swen? I personally had a almost similar experience, one that I was very reluctant to join cheerleading, and half "scammed" in, half "doing a favour" for my then neighbour, and my first ever mentor in cheerleading Calvin Teo. You never know where life will take you sometimes, but I have to say from my experience, take all opportunity that comes to you, be a "yes" man, always say yes if possible and you never know when the next decision you make will become your destiny. If you are already a cheerleader or comtemplating whether or not to join cheerleading; do not ask what cheerleading can give to you, instead ask what you can give to cheerleading in future, when you make that all important decision. A video by Chaang and tagged by Ochi for our 3rd entry for September VoM. A video made about a typical sunday where Wildcards members gather to sweat it out in the gym. In the video we can see Gary running (then continue to hear him running throughout the video), Clement doing deadlifts and Ochi doing standing mititary presses. If you are familiar with gym weights, you will know that the weights that they are lifting are no joke, only the seasoned person will be able to achieve such weights. The video once again showed the importance of physical fitness, strength in cheerleading. It not only allows you to stunt better, it also prevents injuries to yourself and also to the flyers stunting with you. I am too a huge believer of physical abilities when it comes to cheerleading; if we say cheerleading is a sport, lets all have a go at it as a sport and people will respect you as a sportsperson. The 1st entry of BPOM September is by Tina(? correct me if I am wrong) and tagged by Lek Yuan. Titled "Who says Cheerleading isn't a sport? ", it is a post that re-emphasize once again that cheerleading is indeed a very serious sport, regardless of what many people may say out there. Even till today, sometimes when people take up cheerleading, even they themselves might have doubts or sketicism about cheerleading, about it being an activity along the lines of girls who hold pom poms and do little cheers, or all the guys who join cheerleading are homosexuals or gays, as put across by in the blog post. But after they are in it and get really involved for an extended time, they will realise that though there might be some truth (girls still do hold pom poms), but it is definitely not the entire truth and should never be taken out of context as well. So as what the blog post intended, it is to remind people that cheerleading is very much a dedicated and tough sport, with risk no less than contact football. A very well written post with good videos and illustration to bring this point across as well, not just to the general public I feel, but also more for those new cheerleaders who might still have that lingering doubts in their minds, and also a timely reminder to all cheerleaders to be proud of themselves. 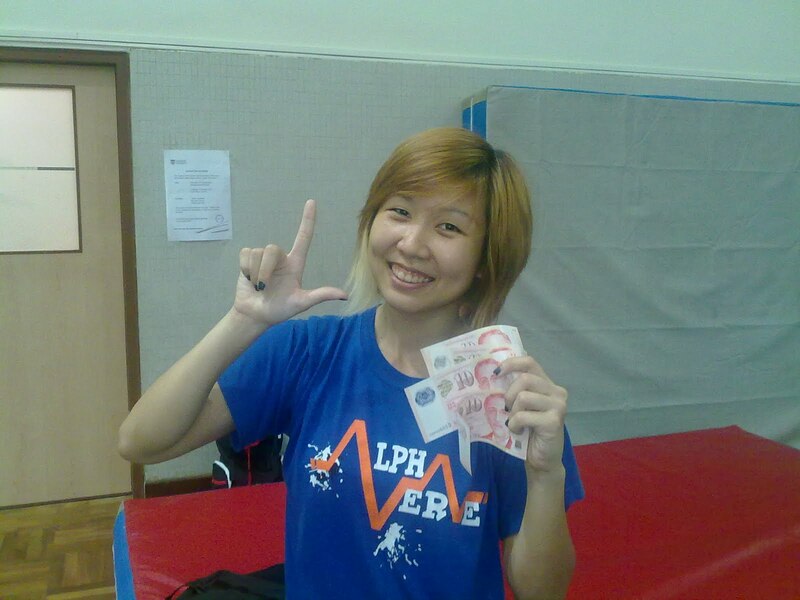 The 2nd video entry for September VoM is by Li Jing of Alpha Verve. Great video done; excellent music selection with effects to coincide with the video actions and wonderful clips editing. The video shows the various elements of cheerleading, how fun cheerleading can be, and how all these are rolled into 1 with Alpha Verve. Alpha Verve had indeed came a long way, ever since the first time I met them many years ago, and I have the strong feeling that much more will be seen from Alpha Verve in the coming years. The 1st entry for September VoM is a video titled consistent by Michelle and tagged by Fairul. First of all I got to apologise for missing this video out as an entry for August VoM, but I shall make it up by including it as the first entry for September VoM. This is a video of legacy's training with Michelle as the mid teir for 1-1-2 pyramid. Have to give it to Andra the shoulder stand base for this pyramid, taking all of the weight almost all by himself. As the video titled it, consistent is the key, consistency is the key to success. I remember that when I was much ‘younger’ in Cheerleading, I was told that if I ever want to be a champion, I need to behave like a champion. Train like a champion, eat like a champion, sleep like a champion, talk like a champion and think like a champion. I’ve seen many individuals attend training without fail, give full participation during training, and most importantly, hit the gym 7 times a week. Many of them followed this idea yet the result did not turn out as desired. And since then, they fell into the pit of doubts and negativity. What went wrong exactly? I thought I was told that if I just behave like a champion, I would be one too? The problem actually lies in ‘think like a champion’. Many inspired to be one, but most failed because they do not have the proper mindset to be one. We go online and search for all the things champions would do and follow them closely, but how many of us actually put in time and effort to research about their ‘thinking’? Maybe the following ‘formula’ would be a better illustration of this BE-DO-HAVE concept. Our thoughts give birth to actions which determine our results. If you want to be a champion, you need to first think like a champion. You must THINK like a champion then you can go on to proceed to behave like a champion. I believe all champions have gone through hellish training and discipline to be one. If you do not have the mentality of champion such as perseverance, endurance, discipline and etc. Do you think you can survive the training in the first place? Donald Trumph said this in his book. A lot of people did not win because they did not set out to win in the first place. Since winning is not important, why would ‘winning’ goes to them? Every game Donald Trumph played in, he play to win and most importantly He won. Maybe I could give you another simpler illustration. Take for example; you have a very beautiful girlfriend that everyone wants to go after but she chose you over other suitors. IF, what you are telling your girlfriend every day is ‘you are not important’, what’s important is the process of courtship. I think sooner or later, your girlfriend would leave you eventually. This goes the same with anything you want in life, be it money, people, friends, good grades and etc. You will never get it because it is NOT important, that’s why you subconsciously ‘avoiding’ it or rather ‘rejecting’ it. If your mindset is right, even God can’t stop you from winning or achieving your true desire. Most importantly, BE HONEST with yourself. If you truly desire to win, then WIN. Don’t need to care about the noise around you. As there were no entry for BPoM July, therefore the prize was rolled over to BPoM August. Further to that, to match the VoM prize of $100 for Kentucky Special VoM, another $100 was added to the prize for BPoM August. 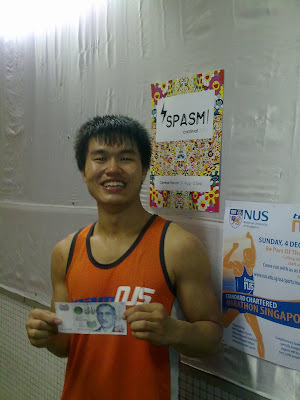 Therefore this month, the grand total prize the winner of BPoM August'11 will win is $200. Lets not delay anymore and announce the winner for BPoM August'11, and it goes to the post by Ken,"Cheerleading in Singapore". Congratulations Ken for the post, you have won yourself the total prize of $200. "Ken touched on some controversial topics in his entry but was still able to give an unbiased point of view, which I felt was important. Ken has mentioned about critics trying to play down the efforts of those who are proactive in contributing to the local cheerleading scene, which I agree. Such critics add zero value and is not constructive at all! Robert Kiyosaki mentioned in his book ''Rich Dad, Poor Dad'' of the essence of ''give, and you shall receive''. Don't take my word for it. If you do your homework, you will realise it is those who have been proactively giving to our cheerleading industry that are the ones benefiting in one way or another. 'Old school 'cheerleading mentality has to go. If you build your goals based on hatred, everything you plan will eventually backfire. If you purposely hold back information to your cheerleaders for the fear of your own inadequacy, your actions will eventually be the downfall of your team. Do you really think you can deny the influence of social media? Instead of being resistant to changes, we must learn to use changes to our advantage. At least for cheerleading, help is available everywhere. If you have financial difficulties, VOM and BPOM are two readily available sources with no bonds attached - all you need to do is blog/video' . If you need advice on how to coach a certain stunt, there is a fb forum for Singapore cheerleaders to interact. 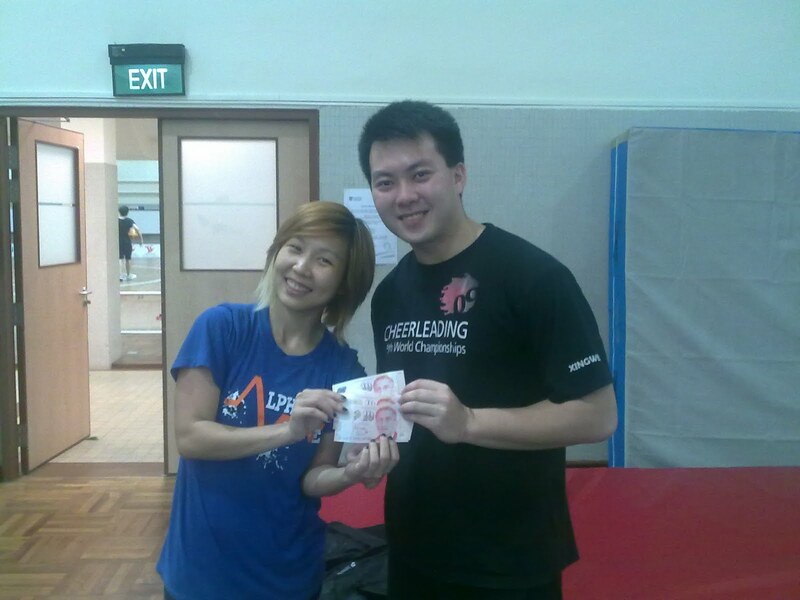 If you want to learn advanced partner stunting but feel that you are being held back for whatever reason, Gary has set up a dedicated partner stunting session which includes almost all cheerleaders in Singapore - once a week. Gymnastics lessons for all cheerleaders are also available at Jurong Safra gym at $15/session - where i see cheerleaders from at least 3 different teams present. Help is always available. So either you grab the hand that is stretched out for you, or you learn to swim on your own (assuming you do not drown in the process). And if you really have to drown, pls do not bring your friends with you. I apologise for this somewhat harsh tone (this was supposed to be a BPOM prize award comment) but i think it is important to build on the points Ken has pointed out. For the benefit of the entire cheerleading industry, we need to up our game. To up our game, cheerleaders must be given proper cheer education. To receive proper cheer education, we must accept changes and learn to let go of the ''old-school'' cheerleading mentality that is hindering our process. ''Imagine that you are a new P plate driver. It is your first time on the road. Being new and inexperienced, you got into an accident and got someone killed because you were not fast enough to react. Yes someone got killed because YOUR CAR knocked that person down. Being inexperienced and new is YOUR problem. That guy got killed by YOU anyway. Painful? This is reality. Not everybody will get a second chance if you take too long to ''learn how to swim''. Congratulations once again to Ken. Give and you shall receive. There will be great prizes awaiting for August and also fantastic announcements for a new promotion for future VoM and BPoM. So give me a little more time and stay tuned. For our 8th video of the month, we have Gary. This video barely made it as an entry for VoM at just 10 secs. haha. It showed Gary doing a toss cupie with Yvonne and followed by a cupie full around cupie. 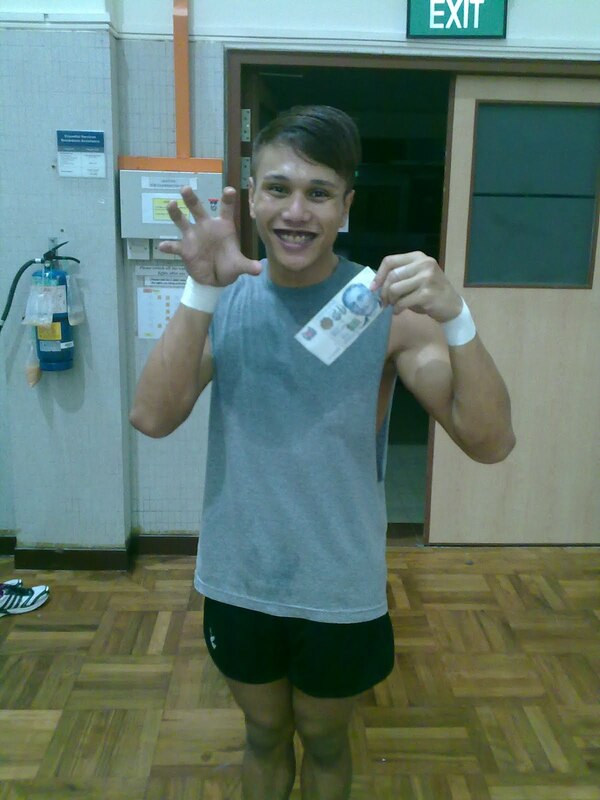 He was the only 2nd guy I seen in SG doing cupie full cupie, simply amazing. In just less than 10 secs, he made the stunt looked easy. Gary had shown to be constantly pushing the frontiers of partner stunting in SG now. The 7th entry for August Vom is by Valerie and tagged by Celine. Another video on some of the trainings in TP Blazers, especially on partner stunts. I can see 5 toss to hands in the team from the video, and also some liberties and cupies coming up. Good job Blazers. Jiayou jiayou. We have the 6th entry, video posted by Celine from TP Blazers. A video clips of their training highlights and breakthroughs in the month of July in partner stunting, B Tosses and pyramids. The video also ended with some fun moments in Blazers where some guys took on the stage as models and entertained the team. Stay happy cheering Blazers. The 3rd entry of BPOM August is by TP Blazers and tagged by Ken for the post, "THANK YOU ASTROS". A simple post to thank Astros for going down to TP Blazers training and conducting a simple short workshop for them. We want to thank them for their patience guidance, I believe all Blazers benefited a lot from all them! Once again, Blazers would like to thank ASTROS for coming down!" It is great to see workshops being conducted in Singapore and all for the love of cheerleading and in the spirit of sharing.